Died: 29th August 1918; age 36; KiA. Residence: 823, Woodbridge Road, Ipswich. Enlistment Details: Location: Ipswich; Date: 12th November 1915; Age: 33 years & 1 month; Occupation: Commercial Traveller; Religion: CofE. Height: 5ft 5ins. 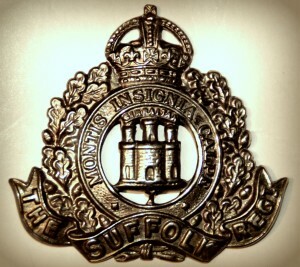 Home: 12th December 1915 – 26th August 1916 – embarked Folkestone – disembarked Boulogne 27th August 1916 – 28th August 1916 posted to 1st/4th Suffolk Regiment. Transferred to 4th Reserve Battalion Royal West Kent Regiment – posted to 7th Battalion, Royal West Kent Regiment. Home 6th November 1916 and sent to 3rd Western General Hospital, Cardiff – 8th November 1916 – Septic Hand – 13th February 1917 – 98 days in hospital. B.E.F. 29th March 1917 – joined 1st Battalion 19th April 1918 – France – 29th August 1918. Wounded in Action – Gun Shot Wound to the fingers on both hands 3rd October 1917 – 4th General Hospital – 2nd January 1918. Regiment: Queen’s Own (Royal West Kent) Regiment, 1st Battalion. 1891 65, Pimlico Road, St. George Hanover Square, Middlesex. Walter was 8 years old and living with his parents & brothers. James William Burton, 47, a Greengrocer, born Wootton, Bedfordshire. Emily Burton (nee Harris), 46, a Greengrocer’s Assistant, born Holborn, Middlesex. Alfred James Burton, 16, a Greengrocer’s Assistant, born Chelsea, Middles. Henry George Burton, 13, born Chelsea. 1901 40, Berwick Street, St. George Hanover Square, Middlesex. Walter was 18 years old, a Stationer’s Assistant. He was living with his parents & brothers. James, 57, a Lavatory Attendant. Alfred, 26, a Furniture Assistant. Henry, 23, a Lamp Maker’s Assistant. 1911 91, Kenyon Street, Fulham, Middlesex. Walter was 28 years old, he was married, a Shop Assistant – Stationery. In 1911, Walter’s wife & son were staying at Tilbury Fort, Tilbury, Essex. They were visitor’s to Thornton Howard Walker, 37, an Army, Quarter Master Sergeant. Leslie James Burton, born September 1909, Fulham, Middlesex. Nora Irene Burton, born June 1914, Ipswich. Walter is also remembered on St. John the Baptist church Ipswich WW1 Memorial.